Christmas is all packed away at my house, thanks to my husband cracking the whip on me this afternoon to get it all done. No, not really a whip. He just started cleaning up while I was sitting around on my lazy behind, which always cues the guilt trip and spurs a cleaning spree. So I hopped up and helped him and magically all the decorations made it to the attic and the trash outside. We had such a great weekend but I’m glad that the cleaning up part is done! As usual, we opened gifts in three different places, starting with brunch at my inlaws house on the day before Christmas where we ate bread wrapped in some bread with a side of bread. Andplusalso some French Toast. 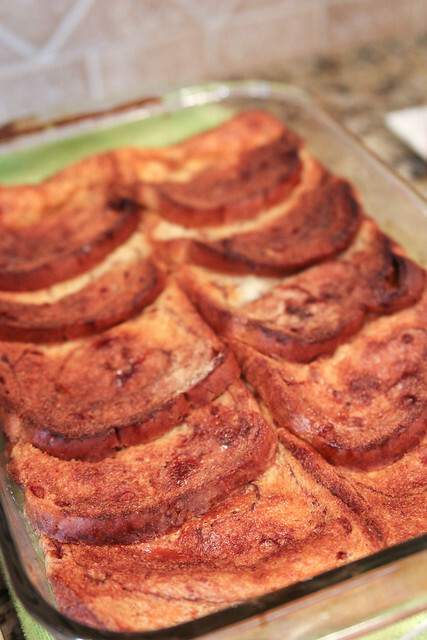 Paula Deen’s Overnight French Toast Casserole, to be exact. I forgot to make the praline topping but we did have some maple syrup. I substituted Pepperidge Farms Cinnamon Swirl bread for french bread. It was GOOD. Even the sausage was rolled in bread. 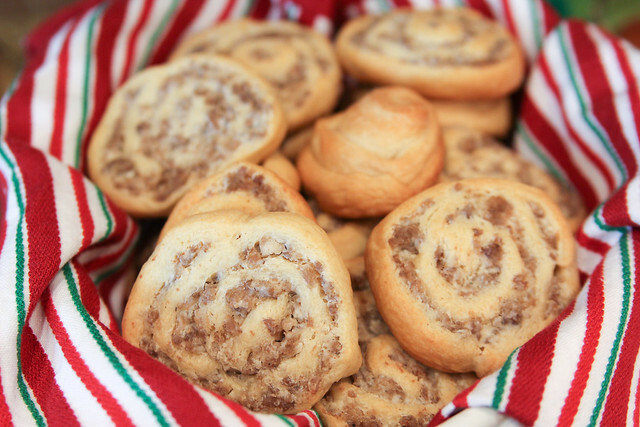 These cream cheese sausage pinwheels were so easy to make, and pretty, too! 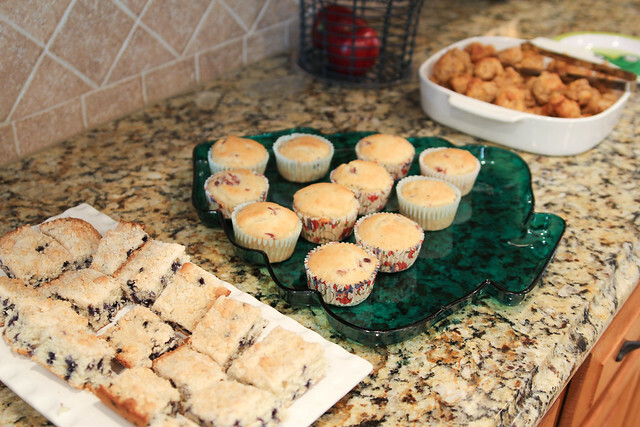 Here is the recipe for these, but there are a lot of variations on pinterest. Unroll crescent rolls into a big rectangle onto parchment paper. Pinch at all edges so they stay together. Make another rectangle of dough with 2nd can of crescents. Lie them flat in the freezer while you cook the sausage and drain. Mix sausage with softened cream cheese. Spread mixture over chilled crescent rolls rectangles. Roll each rectangle into a log shape. Cut the logs with a serrated knife into 1/2″ slices and lie pinwheels flat on baking sheet to cook. Note: If the logs don’t cut easily, you can chill in the freezer again until they are easier to cut. Bake at 350 for about 15 minutes until golden brown. Variations: Add a can of drained Rotel for some extra spiciness. 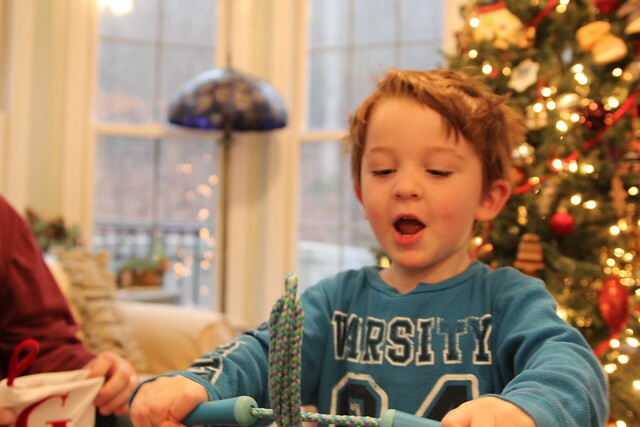 After brunch we let Garrett open his gifts from Nonny and PopPop. 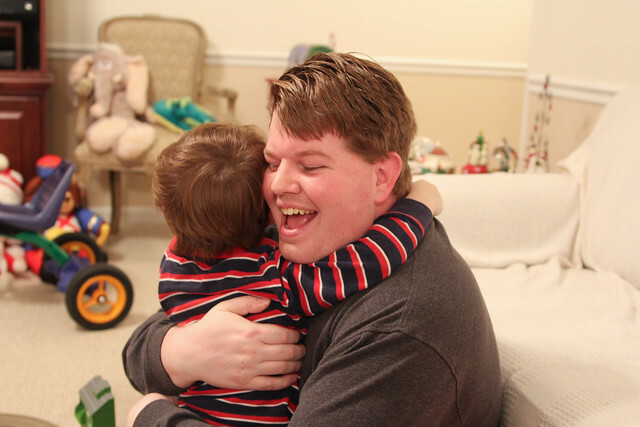 He was so excited for his gifts he ran around giving out spontaneous hugs to everyone. Love it. 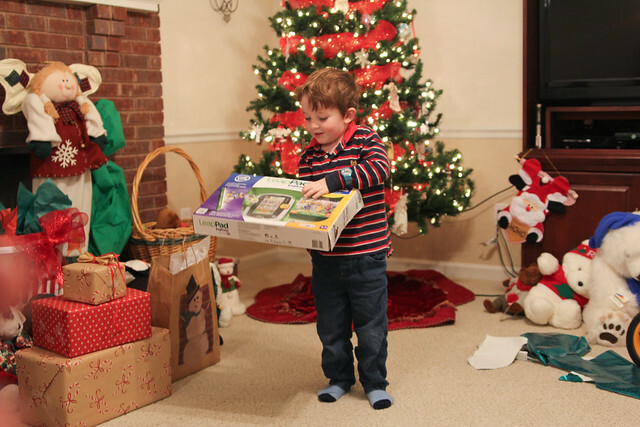 He got all sorts of new toys, including the most loved gift of them all–a coveted LeapPad Explorer. One of my favorite parts of the weekend was taking our firepit down to the bottom of the driveway on Christmas Eve and roasting marshmallows while we waited for Santa to drive past on the firetruck. The neighbors all came over to say hello and even roasted a few with us. Garrett LOVED seeing the 16 year old girl dressed as Santa on top of the firetruck with all the sirens wailing. The next morning he actually slept kind of late (8:00!) 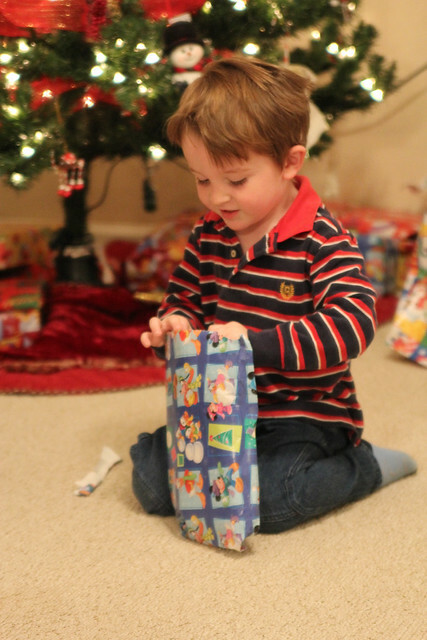 and we got up to watch him open more gifts at our house. He was so happy to see all his presents under the tree. Then he got down to business and Mr. 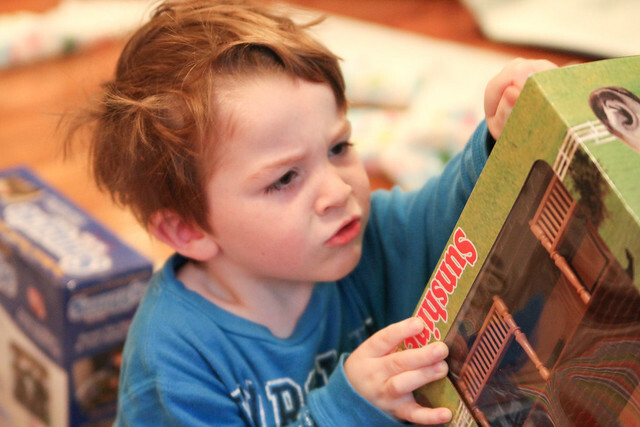 Concentration Face came out as he unwrapped his presents. 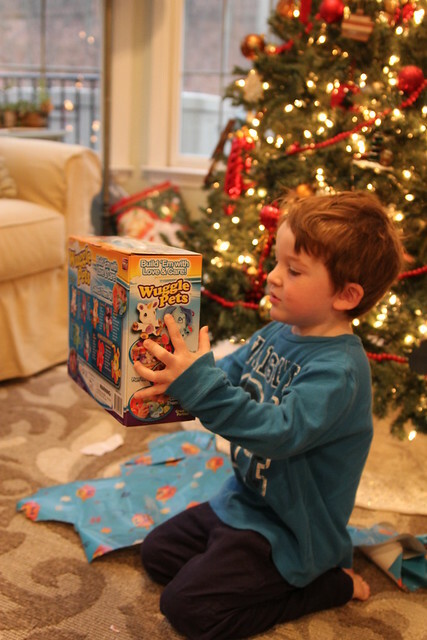 He got his top two gifts, a box of Wuggle Pets…. … and a jump rope! 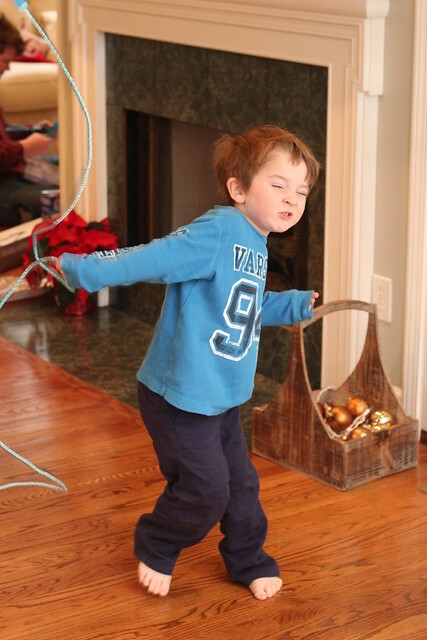 Here is his first attempt at jumping rope. I think he gets his athletic ability from me. Bless his heart. 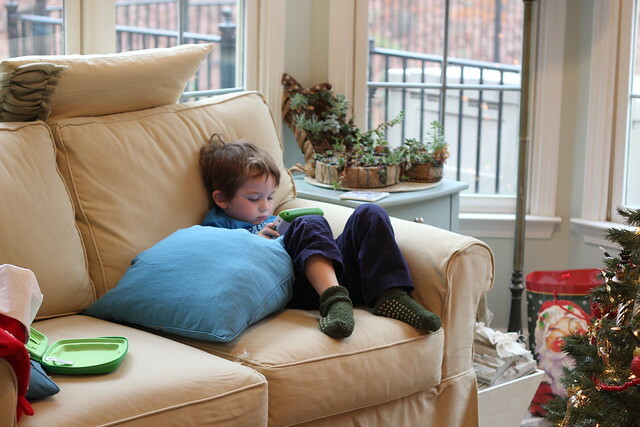 After the gift opening thrill wore off this is where he sat in a LeapPad trance until we were ready to head down to J’s Granny’s house. He was so entranced that he even let me sneak up behind him and take pics over his shoulder without shying away. 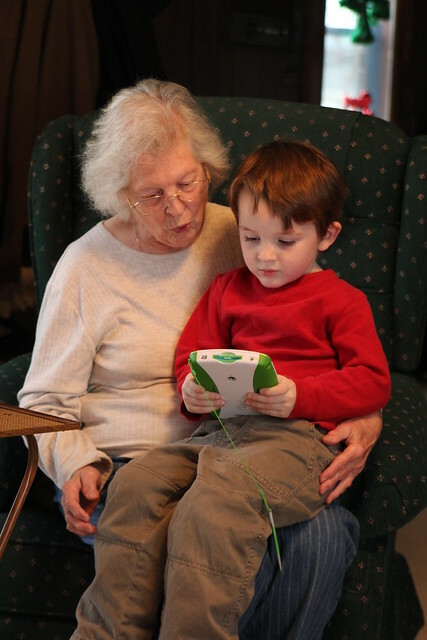 And once we got to Granny’s house it entranced her too. 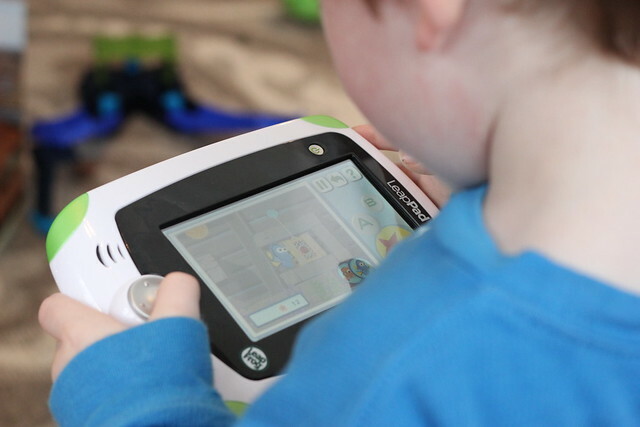 That LeapPad is like magic! Thank you, inlaws! 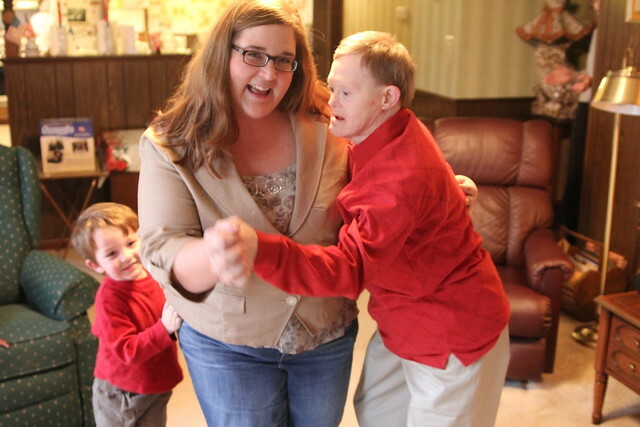 Finally I broke the spell by having an impromptu dance party with J’s Uncle Leslie and Garrett. We had SO much fun singing Christmas songs all loud and offkey and taking turns dancing with Leslie. It was a really great, memorable day. 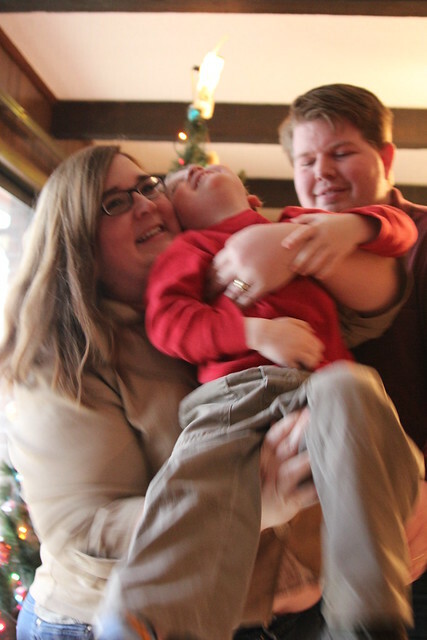 We wrapped things up with our favorite holiday tradition— the infamous posing for the most horrifying family photo of the year. Here is our best shot this year! This might just be the best one EVAH. I hope that you all had a wonderful time this Christmas holiday. 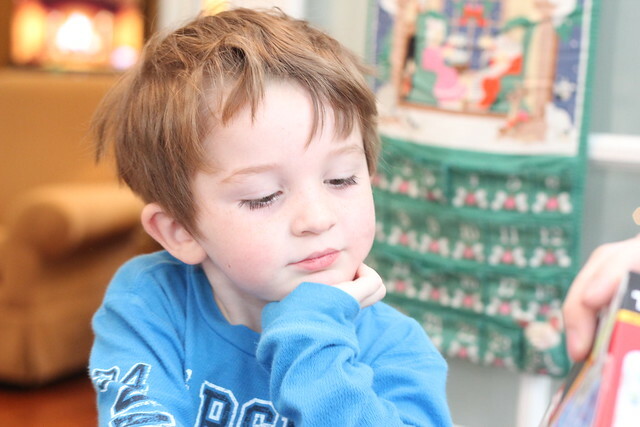 If you were able to get nice civilized poses of yourselves with your preschoolers, please share them! And consider yourself lucky. And I am totally jealous. But Merry Christmas anyway! Hope y’all had as great of a weekend as we did! I’m looking forward to an exciting and HAPPY 2012!